– a good mix of art- the more the better! you can always eliminate when you layout your design. 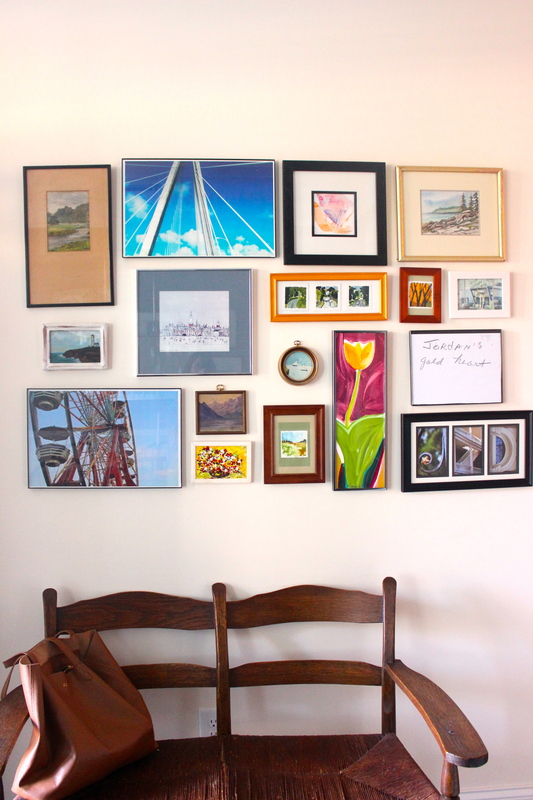 my gallery wall includes thrift finds, original artwork (including a mixed media, abstract ice cream cone by my favorite 5 year old), abstracts and photography. i really like illustrated quotes, organic paintings or photos (rocks, leaves, etc), neutrals with pops of vibrant colors and old maps/topography. -find your art. places to look include goodwill, antique stores, flea markets, estate/ yard sales, online (etsy, 20×200, serena & lily, design darling, etc), anywhere! if you like it, scoop it up! -find frames you like or better yet, if they’re framed already, great! -find a big wall- location suggestions- half bath, entry, living room, kids/playroom. -lay out your design on the floor. make it very uniform or organized. also, here are some layouts. need some real life inspiration? here’s mine!